The Xtreme® rectangular aperture industrial metal detector raises the bar in terms of superior sensitivity, ease of use and reliability. 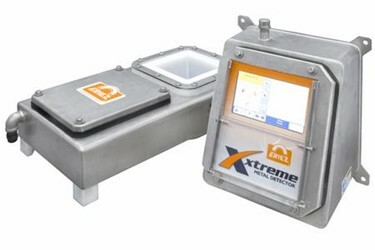 The Xtreme® Metal Detector has been especially designed for industry applications such as chemical, food processing, packaging, textiles, pharmaceuticals, plastics and rubber. Eriez’ Xtreme® Vertical Drop metal detectors are engineered for use in gravity free-fall applications for food manufacturing. The Xtreme® offers increased sensitivity with its multiple frequency range and vibration immunity. An integrated beacon and configurable inputs and outputs enable easy installation and a large control opening creates an easy access point for maintenance. Multiple detectors can be remotely monitored and controlled from a single PC, enabling its users to monitor, analyze and update each system, as if the operator was standing at each machine.